A below-the-hook vacuum lifter and power tilter that uses a dry pump vacuum system rather than hydraulics for lifting steel, plastic, and fiber-glass loads is being introduced by ANVER Corp. of Hudson, Massachusetts. The ANVER ETL Series Powered Vacuum Lifter-Tilter features full powered tilting and is available with a 115 VAC electric or pneumatic actuator for the tilt mechanism. Developed for feeding machinery, this below-the-hook vacuum lifter-tilter has a removable pendant control for up/down and powered tilt, can be rotated manually, and includes a locking pin. 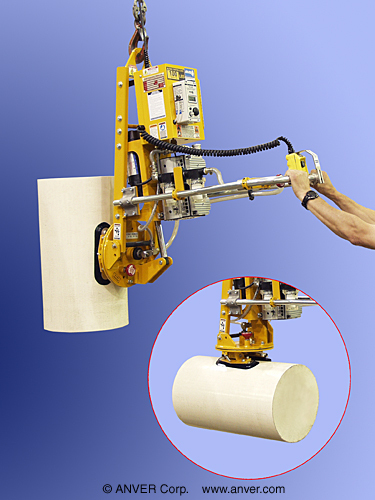 Customized to match application requirements, the ANVER ETL Series Powered Vacuum Lifter-Tilter can be equipped with suction cups made from a variety of special-purpose materials. Allowing one person to lift and position parts up to 2,000 lbs., it is well suited for assembly operations, handling heavy metal, injection molded or cast parts, and related applications.